Nothing quite like talking about the weather, a slightly damp spring, let’s leave it at that! 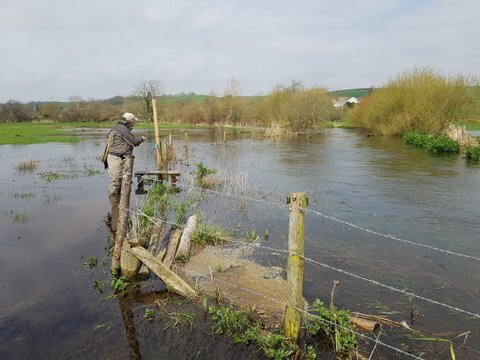 In slightly extreme river conditions, despite the height, the water clarity on the Piddle is lovely and, now this is important, the sun was out, there were Grannom and Olives hatching and a little fall of Hawthorne all drifting down bubble lines to rising fish!!!!! Ian Stirling called by and suggested we take a look and even better take a rod, I managed to open this seasons account with a stunning Piddle fish of about half a pound that sipped down an Olive cast over flooded river bank. Reading between the lines, Ian caught one or two earlier in the week. If you head down to the river, take your time and be careful, these little flurries of activity are short lived, right place right time springs to mind..